When it debuted in 1989, the Tim Burton helmed horror comedy Beetlejuice was one of the scariest, funniest, and most original movies of its time. It wasn’t long after the movie debuted that Burton headed up an animated, kid friendly take on the movie that has turned out to be another of the best children’s cartoons of its time. Even in only four seasons, this unlikely hit produced so many laughs both for kids and their parents who had likely seen the movie. It has remained such a fan favorite because of its storylines and its entirely original animation style. It also is so impressive thanks to voice actor Stephen Ouimette. His portrayal of the “Ghost with the Most” successfully brought Michael Keaton’s character to the small screen. 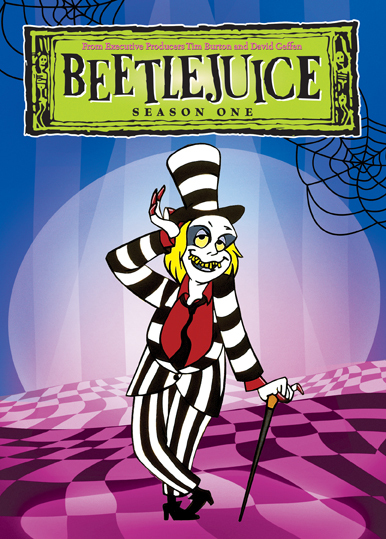 His portrayal of Beetlejuice, along with the show’s writing and animation makes this another example of everything that was once right with children’s entertainment in the late 80s and 90s. This is evident from early on in the series’ first season, which is available now on DVD. Audiences that grew up with Beetlejuice: The Animated Series will remember this show fondly for a number of reasons. One of the most notable of those reasons is the show’s writing. Those that remember the movie on which this show was based remember how everything unfolded. So they will recall that the animated series is quite different. But that’s not necessarily a bad thing. And keeping in mind the proposed plot for a long in the works sequel to the original movie, that Lydia and Beetlejuice would be friends in the series actually makes more sense in hindsight. Having Lydia and Beetlejuice being friends is just one of the positives to the writing behind Beetlejuice: The Animated Series. The physical comedy and the nonsensical plots add to each episode’s comic element. For instance, having Beetlejuice taking on a babysitting service just to earn the money to buy Lydia a gift is completely against everything that Beetlejuice stands for. So it goes without saying that this is a solid first episode to the series. And the jokes that Beetlejuice pulls on Lydia’s dad, Charles, and her rival, Claire Brewster make for more than enough physical comedy for viewers of any age. Suffice it to say that the show’s writers offered plenty more for viewers to enjoy whether for the first time or the first time again. But to discuss all of it would take far too long. So it would be best to go on to another factor behind the success of Season One. From the show’s writing, the next sensible point of Beetlejuice: The Animated Series to discuss is its animation. Beetlejuice: The Animated Series had its own identifying mark thanks to its animation. As a matter of fact, the way that the show’s artists combined actual hand drawn animation with computer based animation was something that no other cartoon at the time was doing at the time. And it wouldn’t be done again for many years to come. It can be argued that its animation style was quite the influence behind other cartoons crafted during the late 1990s and early 200s. A prime example of that influence is Cartoon Network’s short-lived series, Courage the Cowardly Dog. It’s just one of a handful of cartoons that have followed suit. And it’s very possible that without the work of the animators behind Beetlejuice: The Animated Series, these later series might not have happened. Or at least, they might not have been brought to life when they did. The animation and writing behind Beetlejuice: The Animated Series did so much to make this show stand out from all of the other cartoons from which kids had to choose in its original airing. And it still does to this day. There’s one other factor that makes it so enjoyable, even in its debut season. That last remaining factor is the voice talent of one Stephen Ouimette. Ouimette was the man that brought Beetlejuice to life on the small screen. And he did quite the job of it, too. He expertly translated the character portrayed by Michael Keaton (Batman, Batman Returns, Mr. Mom) onto the small screen, making him just as entertaining as Keaton. From the personality, right down to the voice itself, Ouimette was showed time and again that he did his research with this character. There was no better choice for the role, since Keaton was unable to (or simply didn’t want to) voice the “ghost with the most.” He might have only gotten to give voice to Beetlejuice for four seasons. But in those four seasons, he helped make Beetlejuice one of the most entertaining and ironically kid friendly characters on television. And along with the writing and the animation, the whole show proved to be one of the best on television at the time. It proves even today, to be one of the best even on DVD. It is available in stores and online and can be ordered direct via the Shout! Factory store at http://www.shoutfactory.com/?q=node/217313. This entry was posted in Celebrities, DvD's and blu-rays, Internet, Television and tagged Alec Baldwin, Alice in Wonderland, Batman, Batman Returns, Beetlejuice, Cartoon Network, Courage the Cowardly Dog, David Geffen, Edward Scissorhands, entertainment, facebook, Frankenweenie, internet, Julia Roberts, Michael Keaton, Mr. Mom, Phils Picks, Stephen Ouimette, Television, The Corpse Bride, Tim Burton, Wordpress by philspicks. Bookmark the permalink.